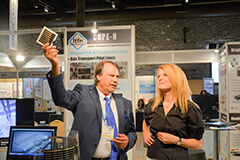 Here are some news related to NANOTEXNOLOGY multi-event organized annually by HOPE-A. In the framework of NANOTEXNOLOGY 2017 and during ISFOE17 , on Monday July 3rd, the HOPE-A & JAPEC Joint Workshop took place, highlighting the cooperation between Greece and Japan in the fields of Technology, Innovation and Business in the era of Organic Electronics. The Workshop included presentations explaining the technology and entrepreneurial activities of HOPE-A and JAPEC partners. Below you can find some of the workshop's highlights. 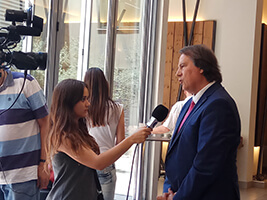 LTFN performed a large Press Conference took place on 29 June 2017 at the Porto Palace Conference Hotel, Thessaloniki, in order to inform the public about the prestigious award of the FP7 EU Project Smartonics coordinated by LTFN and the inauguration of the NANOTEXNOLOGY 2017 multi-event at 1st July in Thessaloniki. The first part of the press conference focused on the presentation of the Award of the EU Smartonics Project by EU during the EuroNanoForum 2017 event organized by EU in Valeta, Malta at 21-23 June 2017. Smartonics has been awarded as a 1st Runner Up for the Best Project Competition, a highly prestigious award from EU in recognition of the project's potential impact, dissemination and outreach towards industry and society. 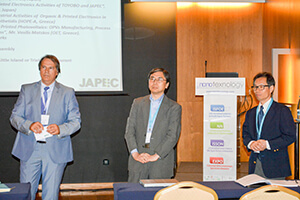 The collaboration between HOPE-A and JAPEC is a main driver for the advancement of the Greece-Japan Cooperation in Technology, Innovation and Business in the era of Organic and Printed Electronics. The topic of the Joint Workshop is to promote networking, twinning, joint ventures and business between members of HOPE-A and JAPEC and their associated partners in order to foster the creation of partnerships, B2B and collaborations through bi-lateral and/or under EU H2020 programmes between Greece and Japan. 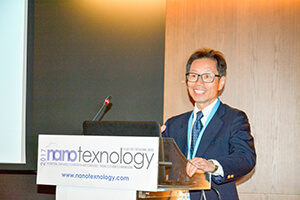 This Joint Workshop will take place during NANOTEXNOLOGY 2017 and will present the current state of technology and entrepreneurial activities of the HOPE-A and JAPEC partners in Greece and Japan on Organic and Printed Electronics nano-materials, devices (OPVs, OLEDs, OTFTs, sensors, etc), equipment, precision metrology tools, manufacturing processes, integrated systems and products, and applications in Energy, Lighting, Electronics, Automotive, Healthcare, 3D printing, Wearables, Internet of Things, to name but a few. HOPE-A will participate at NANOTEXNOLOGY Exhibition 2017, during July 3 - 7 in Thessaloniki, Greece . Visit us at our booth C7. You can find out more here. NANOTEXNOLOGY 2017 Last Minute Poster Submission is OPEN until June 4, 2017. Register now and grab the chance to present your work to the largest technology, networking and matchmaking Nanotechnology annual event in Europe! 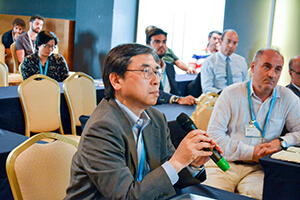 On Tuesday July 5th 2016, during the NANOTEXNOLOGY 2016 multi-event which took place at Porto Palace Conference Centre and Hotel, Thessaloniki, HOPE-A and JAPEC (Organic and Printed Electronics Associations of Greece & Japan) signed their MOU in the presence of Ms. Theodora Tzakri, Deputy Minister of Economy, Development and Tourism of Greece. Below you can find some photos and highlights during this event. 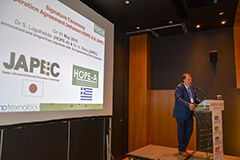 During NANOTEXNOLOGY 2014 multi-event, on 10 July 2014, Prof. S. Logothetidis (HOPE-A) and Dr. G. Darlinski (COPT.NRW) signed the agreement of the cooperation. COPT.NRW, (Center for Organic Production Technologies North Rhine-Westphalia) is an association which acts in the business and science field and takes commercially and technologically key future technologies of organic electronics into focus. It was founded in January 2012. You can find more information about COPT.NRW here.